In each one I was going to have them figure the 10th term and discuss ways they were thinking about it. The idea that I wanted to emerge is the importance of accounting for the number at which they were starting and I also wanted to see how they made their predictions. I was going to end the talk by asking what the graphing story would look like if the first term was a starting height and it continued growing at this rate to connect back to our graphing stories from the previous day. As it sometimes happens, I did not make it as far as I had hoped because some amazing conversations were happening in the very first set of numbers. 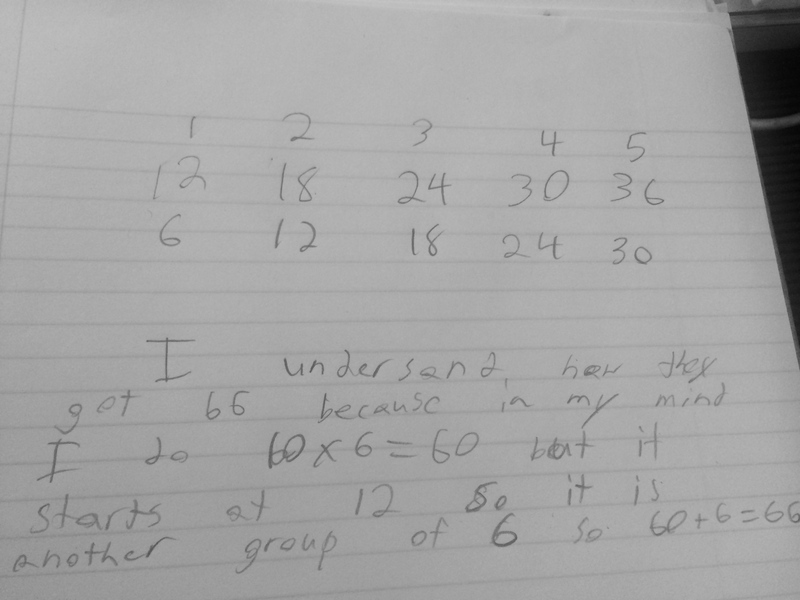 I had a student count by 6’s while I recorded, starting at 12 and stopped him after I wrote 30 on the board. I purposefully stopped there because I was curious to see if students would think about the next (5th term) and double to find the 10th as they did the day before. There was an overwhelming agreement for 72 for that exact reason, but since I got a few different answers for the 10th term, I wrote them all on the board and the proving, agreeing and disagreeing began. There was one, lone 66. – Found the 5th term as 36 and doubled it to get the tenth term. – Did 6 x 10 to get tenth term but then added 12 because he started at 12. I was excited to see he was acknowledging where the series started and the idea of the start being important. 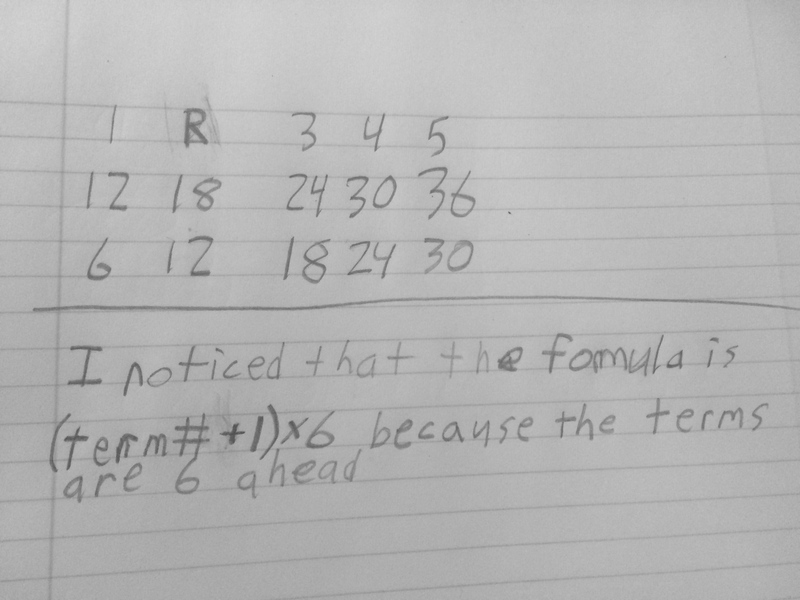 The lone 66, then did a simple continuous count to the 10th term proving that it would be 66. Heads tilted and eyes squinted. 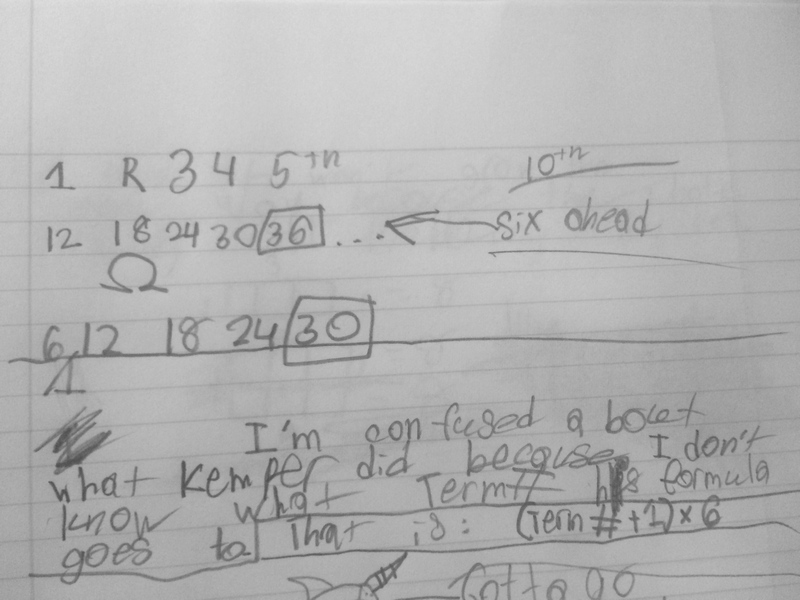 I realized at that moment how much I appreciated that the students looked for ways to think about the 10th term without having to count up to it, but also realized that we needed to do a little more work in thinking about what was happening in the sequence. 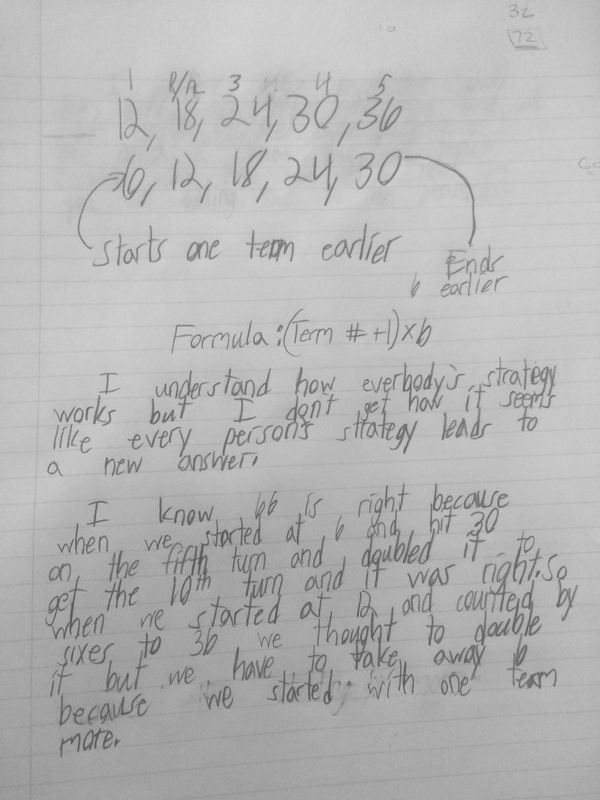 The debate continued and great ideas were coming out about what being the 1st term meant and then one student (the 66) said well it has to be right because (the term number +1) x 6 works for every one of them. That threw most kids for a loop and definitely not a place that I thought most of the class would be ready to engage in conversation around. I let a few students question what he meant, and I let him answer them. 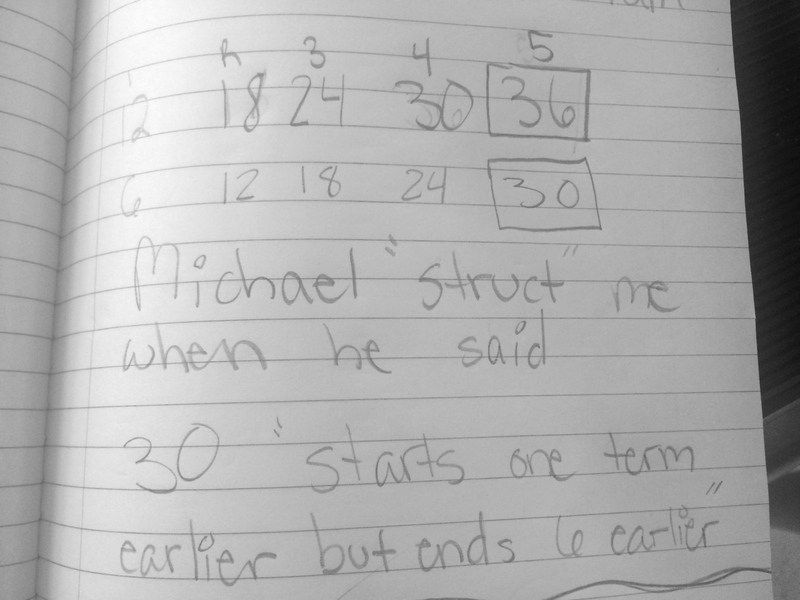 The biggest disconnect for students was how the term number factors into finding the number in future terms. To them the term number was just labeling and not really relevant in the values. and of course there is always one that I want to find more about because it seems nothing like what the others thought about..
After this talk, we went into some pattern building with rectangular arrays and finding the nth term. So much to write about that too, but will have to save that work for another night! 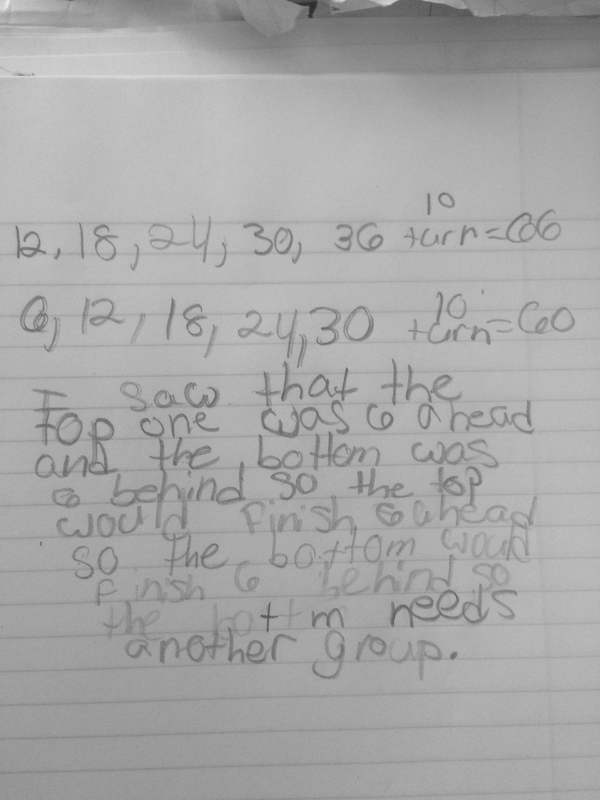 Tomorrow, I want to go back to second number talk set I had intended to do today and see how the conversation builds on our thoughts from today. Do they think about the starting number now? Do they talk about the numbers as “terms”? I think I will have them journal about what they find is most important when predicting what future terms would be in the series. 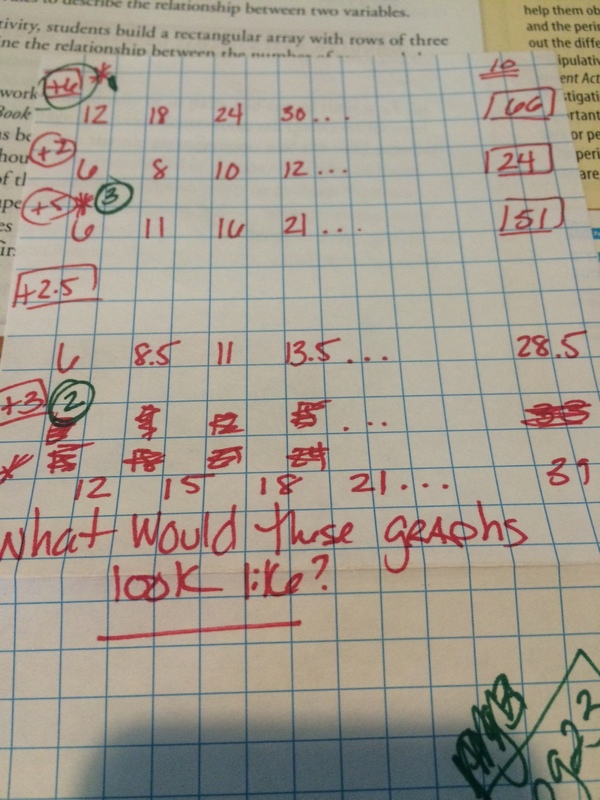 This entry was posted in 5th Grade, Patterns and tagged 5th Grade, Patterns on May 28, 2015 by mathmindsblog.